Fútbol Club Barcelona, also known as FCB, FC Barca, and FC Barcelona, is arguably the best soccer team in the world, making any game at Camp Nou a worthy use of time and money. Recently I was able to catch Barca vs. Real Sociedad where Barca came away with a 4-0 victory over the San Sebastian team. The South American “Trident” showed up in full strength with two goals from Neymar (Brazil), and one each from Messi (Argentina), and Suarez (Uruguay). I guess there's a reason they're 3 of the top 10 highest paid soccer players in the world. I haven't been to enough European matches to know if it's widespread, but the Barca game was unlike any American sporting event I've attended. With 99,354 seats, Camp Nou is the largest stadium in Europe, yet there's no announcer, no sound system, and very limited concessions. At Camp Nou, going to the game is 100% about the game and the sport. I must admit, I did miss the announcer booming “GOOOOOOL” into the mic at the appropriate time, but aside from that, it was oddly refreshing. The stadium is packed with fans who self-organize for chants and cheers. The result is a less coordinated, but much more authentic cheering effort. To assist in the coordination, there's a group of super-fans in one section who bang on drums, wave flags, and do their best to lead the stadium in familiar tunes. “Focused” is the one word I would use to describe the energy in Camp Nou during game time. Many fans bring in radios to listen to the play by play (supposedly 92.5 is the most synchronized, but it's in Catalan...) and from kickoff to half time people are in their seats or on their feet. At halftime people rush off to grab a snack or hit the bathroom, but once the second half starts they're back at it again. You can tell that people genuinely love the sport, not just the experience of being in the stadium. Another indicator of Catalonia's devotion to Barca is that every seat at Camp Nou is reserved by a season ticket holder, so getting tickets, especially at a reasonable price, can be tricky. 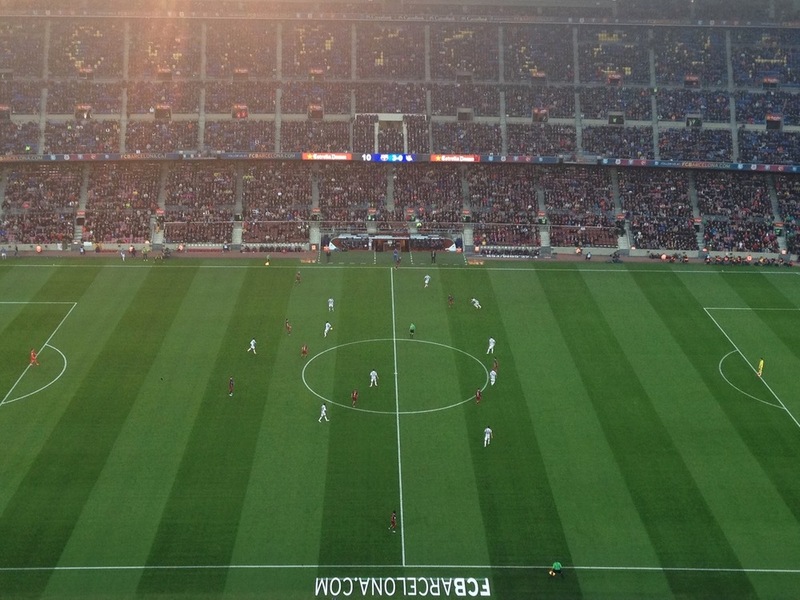 There are a number of websites where members sometimes attempt to re-sell their tickets, but Camp Nou also gives members the option to sell tickets back to the stadium. When this happens, Camp Nou opens those tickets up to general admission sales. Many of these tickets don't go on sale until a few days before each game, so if there's a particular match you're interested in seeing, know that you might need to wait until the last minute to purchase your tickets here. The website's recommendation is to check back daily to see which seats have opened up. If you're in Barcelona, you can also purchase tickets at the stadium, the tourist center in Plaza Catalunya, or any official FBC store. If you'd like to purchase tickets through a 3rd party site, check out Viagogo, Ticketmaster, or Spain Ticket Bureau. These are all reputable ticket sale websites. Many members will first attempt to sell tickets through these sites since when they sell their tickets back to the stadium, they only get 50% of the ticket sale price. However, supposedly for the best prices and the guarantee of a ticket, purchasing directly from Camp Nou is suggested. No matter how you get your ticket, if you can squeeze a game in, it's highly recommended. You'll enjoy a sporting event unlike any other while watching a team (specifically a trio of forwards) who's skill are unmatched.